The English Cocker Spaniel is a dog that does exceptionally well with a family. It likes to remain close with its caretakers rather than sit alone in a corner. It is one of the more intelligent breeds and owners will often find their dog is inquisitive and very well mannered. The English Cocker Spaniel, unlike its American cousin, shows more of its hunting dog roots. Because of this, owners of the English Cocker Spaniel will find that their dog will be extremely determined and fiercely loyal. Also because of these hunting roots, the dog requires a considerable amount of exercise and the owner should be able to give the dog the exercise that it needs. Should the dog's owner not be able to give the dog enough exercise, the dog will be sure to let their owner know by tearing around the house and being very destructive. Keeping in mind the English Cocker Spaniel's need for exercise, an owner must also keep in mind that this is a necessity for the dog. The owner should be sure to give the dog plenty of exercise by taking them on long walks, playing with them in backyard or any activity where the dog is able to run and play. The owner must also keep in mind that while the dog is able to live in mild to warm climates it is best for the dog to live inside because of their need to be with the family. As for the upkeep of their coat, the owner should be sure to groom them properly. Brushing is key to keeping a coat healthy as well as cutting the hair around their ears and tail. The final note on upkeep is to be sure their ears are cleaned on a weekly basis. 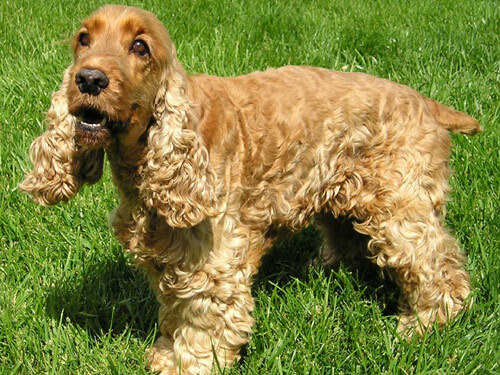 Continuing with upkeep and general health care, the English Cocker Spaniel does have some health concerns that an owner should be concerned about. They are prone to kidney disease and should be tested throughout their life. Another thing they are prone to is thyroid problems; which should be looked after throughout their life as well. Later in life, they tend to develop joint problems; just as anyone would as they age. An owner should speak with their veterinarian about proper care for their dog at any age. The English Cocker Spaniel has an average life span of twelve to fourteen years. One final thing to consider is where the English Cocker Spaniel came from. The Spaniel family started out as hunting dogs and they were primarily used to hunt birds. The Cocker Spaniel family is considered to have split from the main Spaniel family in 1892 when their sizes were noted to be different. The separation between American and English Cocker Spaniels came when American breeders started pushing for changes in the breed that traditional English breeders did not go along with. Both breeds were considered to be separate breeds in 1936 when they were shown separately in American shows. An English Cocker Spaniel club opened its doors in America and the two breeds became official recognized by the American Kennel Club as separate breeds in 1946. Because both the American and English Kennel Clubs wanted to keep their breeds separate, interbreeding between the two was discouraged. Because of this, the American Cocker Spaniel became very popular in America and the English Cocker Spaniel became more popular in every other part of the world. The English Cocker Spaniel became so popular in other parts of the world that it is usually just called the Cocker Spaniel.